In this article, we have discuss about the courses after 12th students for Arts stream. we have provide the details of courses list, career opportunities and course duration. Students who are interested in higher studies for your arts stream, you can check the full details of course. Just finished your class 10 and are wondering what to study in your class 11 and 12? You reach the first crossroad of your life after 10th standard. 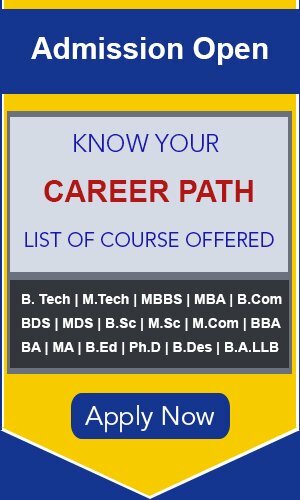 The direction that you choose to take here will help you determine the courses you study after 12th or the career options that you can choose in the future. If you decide to take up the Arts stream after 10th standard, many vistas for higher education and career options open up for you. You can then choose one of the courses after 12th Arts depending on your aptitude and interest. Thinking what after 12th Arts? 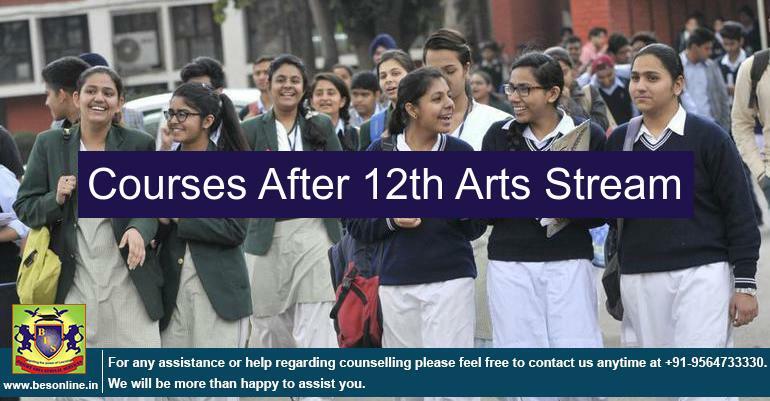 After you complete 12th standard in the Arts stream, there are two options that you can go for. The first option is to go for work after completing your 12th standard. However, the work may not bring you more renumeration. So, it is a good idea to explore the best courses after 12th Arts. You can choose to study a bachelor’s degree, go for an integrated M. A program or opt for certification or training programs depending on your interests, budget, aptitude and other details. Bachelor of Arts (B.A.) – 3 years programme. Bachelor of Business Administration – B.B.A. – 3 years programme. Bachelor of Management Science (B.M.S.) – 3 years programme. Bachelor of Fine Arts (B.F.A.) – 3 years programme. Bachelor of Hotel Management (B.H.M.) – 3 years programme. Bachelor of Event Management (B.E.M. )– 3-4 years programme. Integrated Law course– (B.A.+L.L.B. )– 5 years programme. Bachelor of Journalism and Mass Communications (B.J.M. )– 2-3 years programme. Bachelor of Fashion Designing (B.F.D. )– 4 years programme. Bachelor of Elementary Education (B.El.Ed. )– 4 years programme. Bachelor of Physical Education (B.P.Ed. )– 1 year programme. Diploma in Elementary Education (D.El.Ed. )– 3 years programme. Bachelor of Social Work (B.SW. )– 3 years programme. Bachelor of Retail Management (B.RM. )– 3 years programme. Bachelor of Business Studies (B.B.S. )– 3 years programme. Bachelor of Travel and Tourism Management (B.T.T.M. )– 3-4 years programme. Aviation courses – 1-3 years programme. Animation and Multimedia course– 1-3 years programme. Students who study science in their 12th will have many career options if they take up Bachelor of Art degree in their college. B.A. Social Work & more. B. A Bachelor of Art 10+2 in any stream, students should have secured a minimum of 50% in Class 12 exams 3 years The course depends on the major subject that the student chooses. The popular degree programs include Language, History, Economics, Sociology, Psychology, and lots more. Also Read What are the career options after 10th standard? Are you interested in business and administration? Apply for this course that allows you to explore both streams. There is a lot of scope of work and development in the hospitality industry. You can do a course in hotel management and start your own hotel/restaurant or work in one of the top hotels across the country or abroad. If you love fashion, apparel, textiles, and creating new designs, you can kick start your career in the fashion industry by taking up the degree program in fashion design and technology. Do you like organizing things? You can get paid to do what you like. Complete a degree in event management and start a company or work for one of the leading event management companies. Enjoy fine arts and creative media? You can take up animation and multimedia courses and learn software programs for computer assisted designing. If you are interested in law, then you can take up an integrated course in law after you complete your 12th standard. Do you love teaching? Then get the right qualifications to do the job. After you complete a bachelor’s degree program, you can apply for B.Ed. You can work in government or private schools.